I-CAR does more than just provide the highest quality collision repair training. I-CAR helps businesses in the collision repair industry build a learning culture that maximizes the ROI (return on investment) of training. 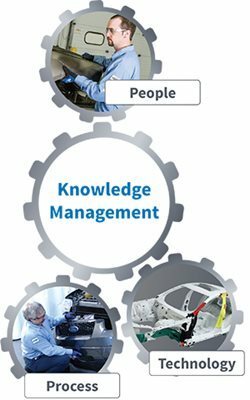 In a learning culture, businesses bring people, process and technology together to work toward knowledge management. Training is no longer simply a requirement; instead, the knowledge that comes from training becomes a company asset. Businesses that embrace a learning culture develop a clear vision for managing this knowledge. They share this vision throughout the organisation so that every employee understands that knowledge is critical to the success of the business. This understanding is more than just skin deep. Knowledge is seen as a key element to business performance, and employee pay structures encourage knowledge development and knowledge sharing. Staff are encouraged to see beyond the limits of their own work so that on the whole, organisational knowledge becomes a true competitive advantage. This competitive advantage not only improves the quality of work performed and increases consumer safety, it also measurably improves business performance. To learn more about the ROI of training contact admin@i-car.com.au for more information.